This page is always being updated according to your suggestions and needs, CASLT bulletins, and the significant contributions of our BCATML Executive Committee Language Reps, for the purposes of supporting our profession. Your French Language Rep is Trish Kolber, and your Elementary / Middle Years Rep is Kindra Harte. Rome Lavrencic, Stacey Sveistrup, Antonella Garcia, and Stacia Johnson also teach French. Looking for fun and creative ways to get your students to practice their Passé Composé over the holidays and not suffer from the ravages of Turkey Brain when they come back in the new year? Try this simple activity where students colour in boxes after they have completed a traditional holiday activity. ​For further language development and practice, student write five other activities (en français bien sûr) at the bottom of the page and then report out when they return to the classroom. Teachers can increase the difficulty by requesting an X-Bingo, Two-line Bingo (in any direction), or the ultimate Blackout Bingo (all squares are coloured in). The possibilities are endless! 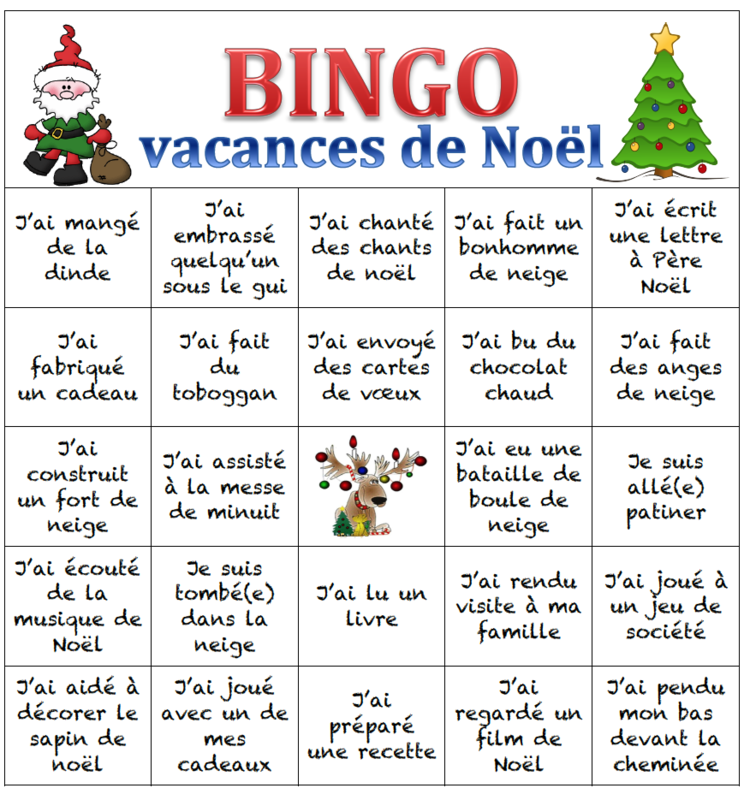 This activity is sure to have your students practicing their French skills over the winter break while having some fun at the same time. Click here to download this French (and English) Word document version which can be easily customized to other activities. This activity is only available for BCATML Members (password protected). First Peoples Principles of Learning now available en français! 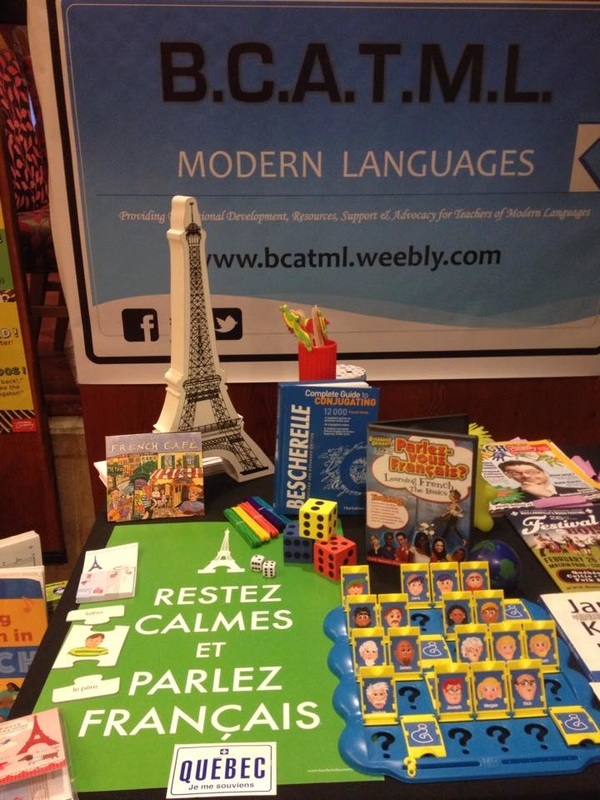 At BCATML's Celebrating Languages 2015 Conference, we unveiled the official First Peoples Principles of Learning poster in French during the Core French Curriculum workshop and Annual General Meeting. Delegates heralded this announcement and appreciatively applauded the look of the final poster. The French translation has been recently approved by the First Nations Education Steering Committee (FNESC). Many thanks go to Marie-Claude Tremblay of the BCTF French Services Branch and FNESC for making this a reality. The First Peoples Principles of Learning were translated many years ago but the French translation was never put into a beautiful poster like its English counterpart. Now that the poster has been approved for French, it will be possible for the Principles of Learning to be translated into the other languages that are taught in BC's schools. We hope that BCATML's Language Representatives will be able to assist in this collaboration. The timing of this poster is serendipitous with the release of the draft Core French curriculum which imbues the Principles throughout. We invite you to download this poster in either format (see left) and proudly display it in your classrooms, staff rooms, library and hallways. The First Peoples Principles of Learning work extremely well with teaching second languages, and we feel that language teachers will embrace these Principles with open arms. This issue highlights a number of professional development opportunities for teachers. Furthermore, you will find several travel opportunities for students to participate in as well as read about the benefits of extra-curricular activities en français. Details about the Concours d'art oratoire among other articles pertaining to increasing bilingualism in Canada are some of the many interesting articles that await you. ​Groupe Média TFO presents IDÉLLO, a dynamic multilevel digital platform designed to cater and adapt to different types of learning. IDÉLLO brings teachers, early childhood educators, students and parents an array of resources and functions that satisfy the desire for new ways to learn. IDÉLLO offers thousands of rich, up-to-date educational resources in French, as well as functions and a workspace that encourage communication between communities of users with common interests. IDÉLLO is a a new learning platform and resource for Teachers, educators, students and parents. 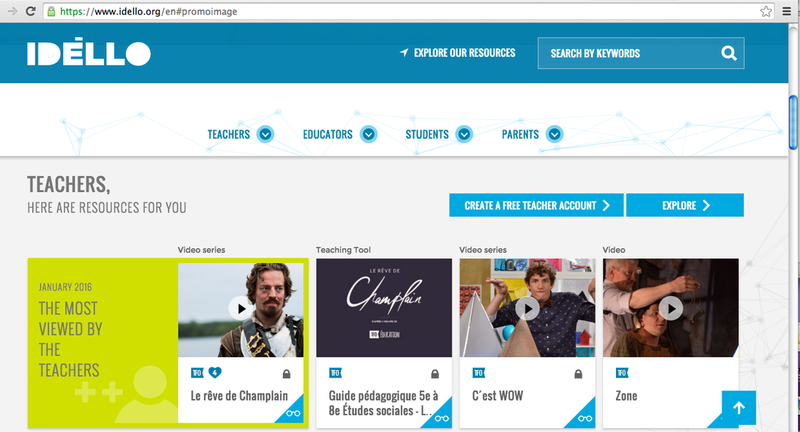 Created in partnership with the Canadian Parents for French, AFÉSEO, and L'Ordre des enseignantes et des enseignants de l'Ontario, Idéllo offers educational content and resources, such as teaching tools and online classes, designed to meet the needs of education professionals. BCATML initiated a discussion with Idéllo in order to bring quality Francophone programming to French classrooms in BC. We are happy that an agreement was reached allowing school districts to purchase institutional subscriptions through their district BCERAC agreements. An institutional subscription allows teachers to manage groups of students, and create or keep track of assignments. Are you employed by a school board, school, or a child daycare facility ? Check if your employer has an IDÉLLO subscription. You can also request an individual subscription, or create a free account. Patti Holm, President of the Canadian Parents for French BC & Yukon Branch, announced the release of a labour market report outlining the serious and widespread shortage of qualified French language teachers across British Columbia. She stated that "[t]he strength and popularity of educational programs, like French Immersion, is fuelling a province-wide need for more and more qualified French teachers." Despite the demand for French Immersion, 86% of BC school districts indicated that it is "challenging" or "very challenging" to fill all available French Immersion teaching positions citing the lack of qualified applicants as the primary obstacle for French Immersion teacher recruitment. The secondary obstacle for French Immersion teacher retention was competition from other school districts. The report also finds that while BC certifies a total of approximately 2,700 teachers per year, it produces about one-fifth of the French Immersion teachers needed. French Immersion student enrolment in British Columbia has steadily increased for the past 16 years. Since 2004, student enrolment in French Immersion has increased by 38.8%, while overall public school enrolment has fallen by 7.8%. In 2013-2014, students enrolled in French Immersion programs accounted for 8.8% of the total public school student population. According to a 2007 study conducted by Dr. Wendy Carr, 78% of elementary school teachers and 71% of middle school teachers do not feel comfortable speaking French, thus creating a gap in the Core French teacher's competency with the language. A majority of BC school districts do not require elementary and middle school teachers teaching Core French to have a specialized background in French that secondary school teachers have. Furthermore, the University of British Columbia is the only institution currently requiring all pre-service teachers to take at least one French methodology course as part of their teacher training prior to entering the workforce. Dr. Carr stated that "teacher education programs need to ensure that all candidates take a French methodology course so that new teachers have at least the basics to teach and inspire BC students to learn French as a second language". Despite a progressive decline in Core French enrolment since 2004, there are 180,000 students enrolled in BC's Core French program, constituting one-third of the total student body. The full report can be viewed by clicking here or by clicking the link below. Are you thinking of continuing your French education? Did you know that there is funding (up to $1600 annually) for your French coursework at BC Post-secondary institutions? The DELF and DALF are six separate diplomas issued by the French Ministry for National Education to certify the language skills of persons whose mother tongue is not French. The results of these exams are valid indefinitely. DELF and DALF certificates were developed by the Centre International d’Etudes Pédagogiques (CIEP) and reflect the six levels of the Common European Framework of Reference for Languages (CEFRL). In 2015, the DELF and DALF examinations are available in 173 countries. The next session of DELF exams have been set for April 20 - 24, 2015. For further information, please visit the site below created by the French Embassy with the latest information as well as a brochure to distribute to your students and school community. Keeping up to date on great links for language teachers is an ongoing process: if you have a great link to share, please let us know! DELF in Canada http://delf-dalf.ambafrance-ca.org/ -get information about DELF exams and other resources. Based on the Common European Framework of Reference (CEFR) for languages, Assessment in Action is a set of adaptable tasks that teachers can use in the classroom to support assessment as, of and for learning at their students’ level in the language being taught. The tasks are designed for FSL classrooms but can be adapted for other languages. BCATML Executive members Nancy Griffith-Zahner and Rome Lavrencic both collaborated on this document and were members of the working committee. Assessment in Action is built around five activity types: Spoken interaction; Spoken production; Listening; Reading; and Writing. It covers the first two levels of the CEFR, i.e. (A) Basic user and (B) Independent user. These levels are split into sub-levels – from A1.1 to B2. Each activity type is based on a “Can-do” statement, which describes an activity that the student can do in the target language. Assessment in Action is published in two volumes: Level A and Level B. Language Portfolios are an integral part of the Common European Framework of References. The Second Language Research Institute of Canada (L2RIC), in collaboration with CASLT, has been involved in the creation of The Canadian Language Portfolio for Teachers (CLPT). L2RIC has also designed and implemented a School Based Language Portfolio. This portfolio is available for download. L2RIC continues to work on language portfolio projects in different contexts. Links to selected BC, Canadian, and American curriculum resources. Teacher organizations and professional associations in Canada also provide excellent resources. Franc-parler est le site pédagogique des professeurs de français. Le site est rempli de ressources et d'information, et vaut absolument une visite attentive. Notamment les onglets POUR LA CLASSE, qui comprend les trois sections suivantes : Fiches pédagogiques, Ressources pédagogiques et Sitographies, et POUR L'ENSEIGNANT, et ses sections : Autoformation, Entretiens et Articles. Pour s'y rendre, cliquer http://www.francparler-oif.org/index.html. SEVEC - government assisted exchanges within Canada - travel with confidence! "How the language you speak changes your view of the world"
Becoming multilingual is key in breaking down barriers for young generations to become true citizens in the global village of today and the future. If you didn't study any foreign languages in school, picking one up as an adult can be challenging, since the human brain is best-equipped to absorb a new language in the early childhood years. Request one of our BCATML Workshops! Using children's books to develop literacy in the Core French Classroom! This Intermediate Core French Workshop will focus on how to use books in Core French. Using books in the language classroom is a very stimulating, motivating, and rich experience for children. Pre-reading, during, and post-reading strategies will be highlighted around one unit. How to build a mini-unit around a text will also be presented. 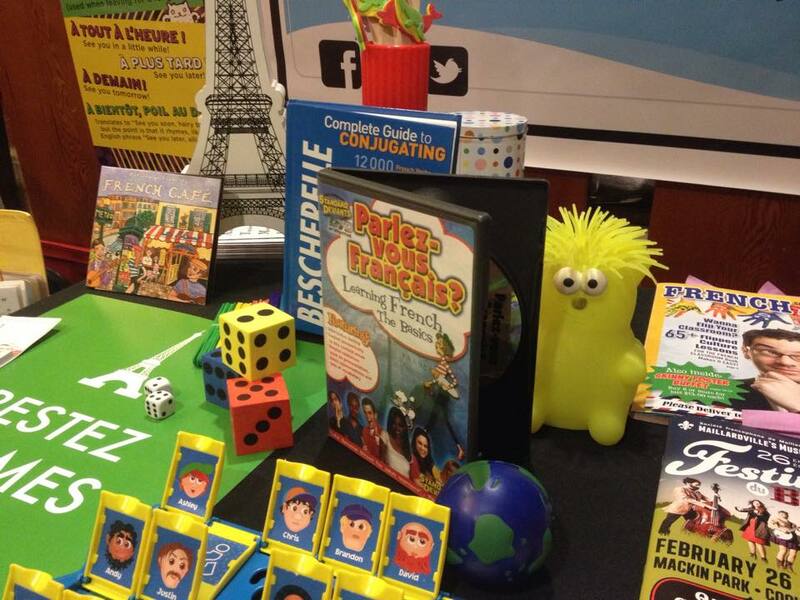 Teachers will learn some innovative ways to develop their students’ language skills in French. Stacey will share activities around one unit that can then be transferred to other units. Activities will be grade-appropriate, interesting for students, and have a purpose for language development. A literacy-based approach, some Intensive French methodology, and tried-and-true activities will be presented. Regardless of abilities in French, teachers will go away with some new and fun ideas to use immediately in their classrooms. Stacey Sveistrup teaches Grade 6 Intensive French at Franklin Elementary in Vancouver. She has spent many years teaching elementary Core and Intensive French for the Vancouver School Board. She has been a School Advisor for several UBC Teacher Candidates in French programs, she is on the BCATML Executive, and she has worked for Pearson Canada developing new Core French materials. Teaching French really is a passion and she enjoys very much sharing it with other educators! I’ve picked up some tips and tricks over three years of TTOC’ing, changing assignments, and collaborating with various teachers. I’ll show a great TED talk that changed my perspective on language teaching, and make reference to the many wonderful teachers whose classrooms I’ve been lucky enough to teach in. Workshop participants will be the ‘students;’ participating in order to experience games, strategies, and scaffolding used in my teaching practice. These games are easy to adapt for different levels, from the most basic vocabulary-based unit for Core French, to even French Immersion 12. The ultimate goal is to help students feel safe engaging in spontaneous dialogue, taking risks (even if it means making mistakes), embracing second tries, and practicing challenging grammar structures out loud. Her workshop permitted Core French teachers to become familiar with strategies and activities to use when teaching the IRP, as well as the Common European Framework of Reference. Some practical activities will be explored for use in an elementary classroom. The workshop will be given in English and/or French according to the needs of the participants.